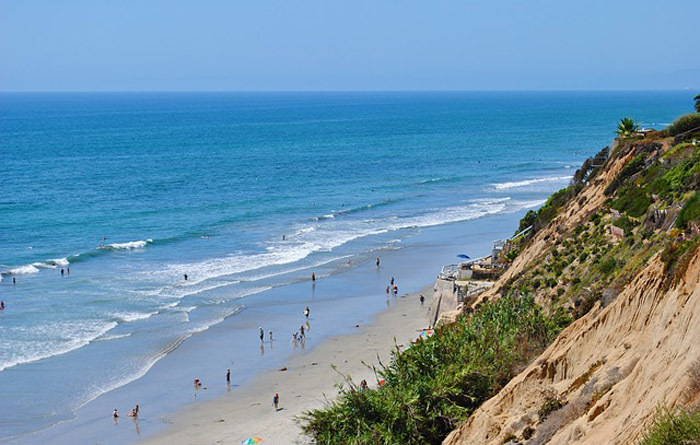 The city of Carlsbad, California is seaside resort city located in the northern part of San Diego County. The city, which spans 39.110 square miles, has a mayor/council form of government and has the nickname the "Village by the Sea." The city is approximately 35 miles from San Diego and 87 miles from Los Angeles as is a part of the San Diego-Carlsbad, CA Metropolitan Statistical Area. The local climate is a Semi-Arid-Mediterranean climate with hot sunny summers and mild winters. Globally Carlsbad has two sister cities one in Futtsu, Japan and the other in Karlovy Vary in the Czech Republic. The first known inhabitants in the area were the Luiseno tribe who had a village along the Palamai. The first Europeans in the area were Spanish explorers in1769. For a time the land was governed by Spain, followed by Mexico and then the U.S. By 1880, there was a water stop for the railroad known as Frazier's Station in the area. After a second well was dug, it was discovered the water was very similar to that of the famous spas around the world and the area soon had an official name, Carlsbad and a major marketing campaign, by the Carlsbad Land and Mineral Company, to attract visitors. Soon this seaside, spa and resort town flourished and faded. But, the community survived due to its fertile lands and agricultural endeavors. The city was officially incorporated in July of 1952. Today, this thriving city is home to the LEGOLAND California Resort and the largest desalination plant in the United States. The city has much to offer like gorgeous beaches, a variety of beautiful parks, three libraries and several attractions like LEGOLAND, Sealife Aquarium, Lake Calavera Preserve and the GIA Museum. According to the United States Census of 2010, Carlsbad was home to 105,328 residents and had a population density of 2,693.1 per square mile. In 2011 the median household income in the city was $85,743 and the median family income was $102,254 revealing the affluence of this beach town. Carlsbad has a strong and diverse economic base. In 2011 the top five employers in the city were Life Technologies Corporation, Taylormade-Adidas Golf Company, Viasat, Callaway Golf and Legoland California. There are many notable businesses with headquarters in the city including, but not limited to AutoClaims Direct, Jazzercise, Jenny Craig, Callaway Golf Company, Life Technologies, Kisco Senior Living and Upper Deck. The city has much to offer like gorgeous beaches, a variety of beautiful parks, three libraries and several attractions like LEGOLAND, Sealife Aquarium, Lake Calavera Preserve and the GIA Museum. Homes for sale range from small homes up through luxury homes in a variety of styles. Other real estate opportunities include apartments and homes for rent as well as condominiums and town houses for sale or lease. Contact local real estate agents for assistants in your search for the perfect home.